“At 120 frames per second your eyes get greedy,” said Hollywood film director Ang Lee (Brokeback Mountain, Life of Pi) at the EMEA first-showing of his latest film, Billy Lynn’s Long Halftime Walk, at a landmark 120fps, 4K 3D and with an astonishing 28 foot-lamberts per eye brightness as part of this year’s IBC Big Screen Experience. It was one of many notable quotes on Monday’s conference of which Lee was keynote speaker. Clips from Ang Lee’s soon-to-be-released film from Sony TriStar Pictures, Billy Lynn’s Long Halftime Walk (2016) - the story of a soldier who fought in the Iraq war - were then shown. The Christie Mirage Series is widely used in demanding applications such as 3D visualization, visitor attractions or theme park rides, since it is able to achieve said high frame rate and resolution, stemming from Christie’s investment in its TruLife™ electronics platform with an industry-leading video-processing pipeline of up to 1.2 Gigapixels per second. 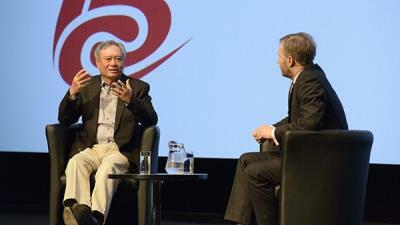 Pinn had spent some 18 months working to bring the experience to IBC and the keynote session was not only memorable for the audience’s reaction to seeing the movie clips but for the insights that emerged from the on-stage discussion between the movie’s team; director Ang Lee, technical supervisor, Ben Gervais; the film’s editor Tim Squyres; and Scot Barbour, Head of Production Technology, Sony Pictures Entertainment. For the 9-minute clip, the two Christie Mirage 4KLHs, the laser-light powered version of the original Xenon-lamp based Mirage, were installed in the auditorium, and a team of Christie engineers supported the screenings. The Christie Mirage series featuring TruLife’s processing bandwidth is seen in amusement parks, casinos, museums and public venues. The Christie® Mirage 4KLH projector head – the laser version used at the IBC screening – combines Mirage’s unmatched video processing bandwidth with the world’s brightest laser system, Christie Freedom® laser illumination system. The projector has a potential of up to 60,000 lumens per head, potentially up to 120,000 lumens when used in a dual 6P configuration (six primary colour system). In the Rai Auditorium at IBC, the configuration was a dual stacked Mirage 4KLH configuration; the 28 foot-lambert spec on the 17.00m wide x 6.69m high Harkness Matt Plus screen required 72, 000 lumen and the laser modules were supplied accordingly. One advantage of the Christie Freedom laser illumination system is that the laser banks are separate from the projector, stackable and scalable.